Dubai our Sandbox: On holiday with our Boba 4G - ' baby wearing' made easy! 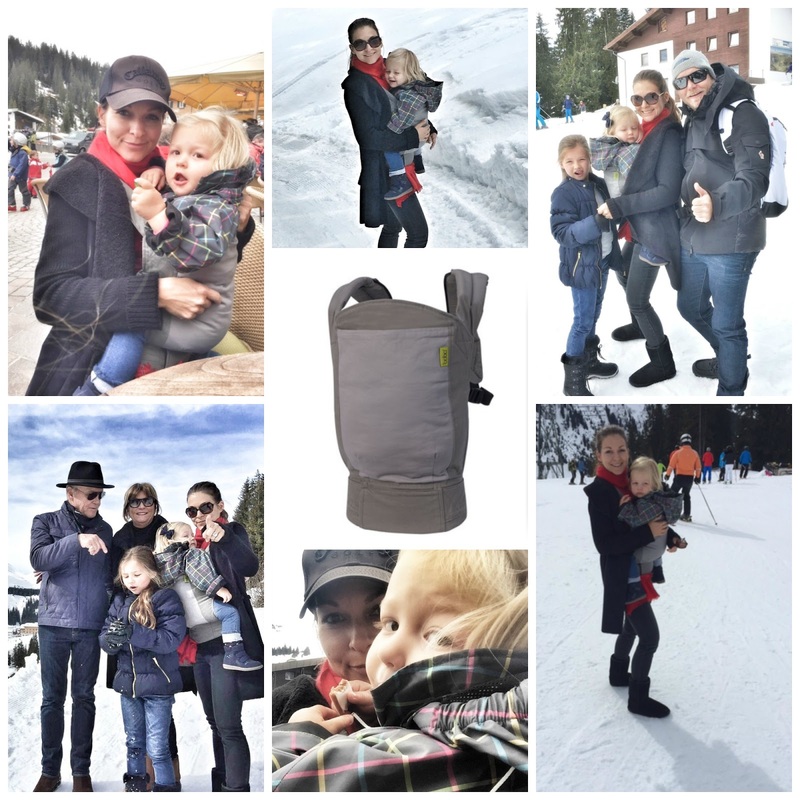 On holiday with our Boba 4G - ' baby wearing' made easy! We are back in our Sandbox! 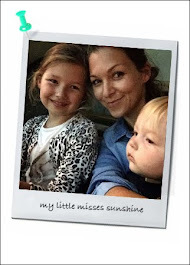 After two weeks off for Spring break holidays, we are now 'home' in Dubai. After a wonderful time in the Austrian mountains and in South of Sweden, we are ready to start the last school term of this academic year! Recently, I have been asked about baby carrier and travel. So when Babysouk.com offered me to review the Boba 4G just before our Easter holiday travel, I was ready to test road it for you (and I). For both of my girls, I used the Baby Bjorn until they were about 10 months. It was great while travelling and running errands but I quickly felt the weight on my back and just did not have the need for it. While packing for this trip, I realized that "baby wearing" would be a nice options for our daily walks in the mountains or the forest and a more convenient and practical way to enjoy wild terrains. I was just a bit worried of Josefin weight being a struggle on my back and if she would be happy to hang out in a constrain environment. Well, it worked out great! And we both really enjoyed the Boba 4G and here's why?! - Suitable from birth up to 20kg, it grows with your child. It's value for money! - Easy to use, no difficult assembly - the shoulder straps are already secured and the waist belt ready to fasten. It's great that it can be adjusted while baby is actually in the carrier by simply pulling on the straps. Easy instructions provided. - Comfortable to wear. Boba prides itself on ergonomically designed products. Never felt the strain of Josefin 11 kilos. Feels like everything from the position of the straps to the padded belt has been designed with comfort and practicality in mind. - Comfortable for your child as well. Little Jo happily sat in the Boba 4G. The design takes in consideration back support, hip and knees position to ensure proper sitting position. - It feel strong and durable, thanks to the soft but sturdy fabric and heavy duty buckles. It suggest a quality and long lasting design. It is also machine washable, but even with a damp cloth, I manage to remove a spill. - Pretty compact, I could roll it up and store it in the carry on while travelling. - The little zipped pockets to store minimum items was a nice little bonus. Just enough for keys and phone. - In the box you will find, infant insert but also foot straps for comfort and a sleeping hood. We did not get to use those items but I would think they are valuable addition to the product. - Nice simple style that Dad can happily wear as well. - Not a problem with us but the Boba carrier can be use worn two ways - as a front and a back carrier. Some moms might miss the face forward option, hip or laid horizontally across your front. - The back position is a bit more tricky to masteries but with a few practise round you will be able to do it by yourself. - The buckle on the back can be difficult to reach at first and can easily tangle into your hair. A couple of practise runs and a hair tie will fix that. 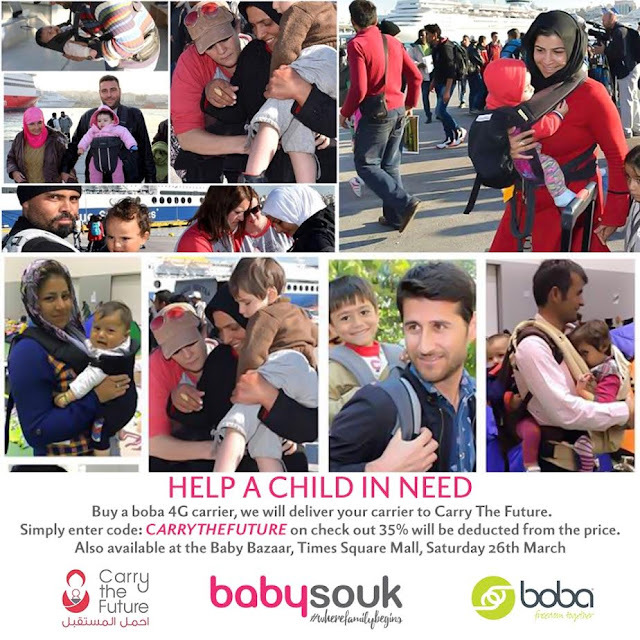 Boba 4G and Carry the Future, a non-profit, international volunteer organisation who collect and distribute baby carriers to refugee families fleeing violence, oppression and persecution have teamed up. Now our favourite online shopping retailer for baby stuff based in Dubai , babysouk.com has joined in to help by offering 35% off all baby carriers. You can also donate your used baby carrier to Carry The Future by dropping it off at The Change Initiative on Shk Zayed Road.